The peacock of Malaysian cities, Melaka City preens with its wealth of colorful trishaws, homegrown galleries and crimson colonial buildings. 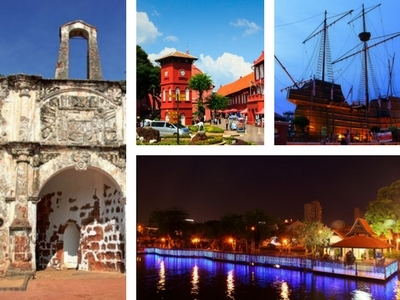 The city’s historic centre achieved UNESCO World Heritage status in 2008 and since then Melaka City’s tourism industry has developed at breakneck pace. Old shophouses and mansions have enjoyed makeovers as galleries and hotels and Melaka City’s kaleidoscope of architectural styles – spanning Peranakan, Portuguese, Dutch and British elements – is well preserved. Tourism has boomed, particularly on weekends when the vibrant Jonker Walk Night Market provides music, shopping and street-food galore, but you’ll share the experience elbow-to-elbow with other travelers. House museum exploring the history of local Chinese-Malays in a large, elegant home. The Stadthuys is a historical structure situated in the heart of Malacca City, the administrative capital of the state of Malacca, Malaysia in a place known as the Red Square. The Stadhuys is known for its red exterior and nearby red clocktower. The highlight of visiting the charming Malay village of Kampung Morten is this living museum within a 1920s kampung house. Visitors (or rather, guests) are welcomed by a member of the household who points out period objects, including photographs of family members, Ming dynasty ceramics and a century-old Quran. The Maritime Museum is a museum in Malacca City, Malacca, Malaysia. With monthly visitors around 20,000 people, it is the most visited museum in Malacca. Kampung Hulu Mosque is a mosque in Melaka City, Melaka, Malaysia. It is the oldest mosque in Melaka. St Johns Fort Melaka is a small white 18th century fort built by the Dutch on a low hill with views over the city of Malacca. A Famosa was a Portuguese fortress located in Malacca, Malaysia. It is among the oldest surviving European architectural remains in south east Asia. Bringing to life 6 centuries of history, Melaka Alive is a ticketed experience among the existing heritage buildings and museums in Melaka. Attractions include special effects theatres and historical shows as well as Malaysian arts and crafts. Jonker Street is located in the heart of the Melaka city. Due to the fact that it is one of the biggest attractions in the state, Jonker Street’s location can be easily found via the various road signs visitors can see along the way when they travel to the place. The Melaka River is where the town began and it has played a key role in Melaka's colourful history. Taking a river cruise is like seeing Melaka from the back door. From a height of 80 metres, the ride offers you a spectacular and panoramic view of Melaka UNESCO World Heritage City and a far with a host of interesting sights such as St.Paul’s Hill, Independence Memorial Building,Samudra Museum and the ship, Flor De La Mar, Dataran Pahlawan, Pulau Selat Mosque, Pulau Besar and the Straits of Melaka.